Flexible, compact and intelligent: our MOVIDRIVE® B drive inverters. They save space in the control cabinet and are equipped with integrated positioning and sequence control as standard. Whether asynchronous AC drives or synchronous servo drives - the MOVIDRIVE® B drive inverters can control it. 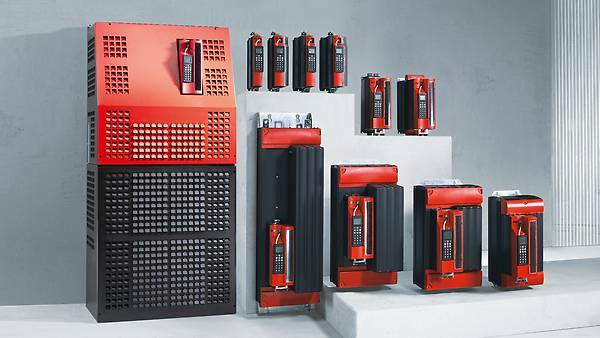 The broad power range from 0.55 kW to 315 kW, the fantastic overload capacity and the modular concept of the MOVIDRIVE® B inverter help to improve the flexibility and efficiency of your applications. The compact design of the MOVIDRIVE® drive inverter saves space in the control cabinet, while its high user-friendliness ensures that you save time during parametrization, while the intelligent IPOSplus® positioning and sequence control is included as standard. A multitude of inputs and outputs in the drive inverter ensure a competent basic functionality. Optional communication and technology modules provide for quick and easy extension. MOVIDRIVE® drive inverters control asynchronous AC drives as well as synchronous servo drives. e.g. fieldbus interfaces, encoder interfaces and safety functions enable individual applications. thanks to its book-style design: it enables a seamless connection and saves space in the control cabinet. with its STO (Safe Torque Off) safety function in accordance with PL d pursuant to EN ISO 13849-1. The units are equipped with the IPOSplus® integrated positioning and sequence control system as standard. They can also be expanded with the available options. "00" at the end of the type designation indicates the standard design. In addition to the features of the standard design, these units include the "electronic cam" and "internal synchronous operation" technology functions. The application version is indicated by "0T" following the type designation. The MOVITOOLS® MotionStudio program package lets you conveniently start up, set parameters and run diagnostics for MOVITRAC® B frequency inverters and MOVIDRIVE® B drive inverters. MOVIDRIVE® MDR60A 15 kW to160 kW MOVIDRIVE® MDR61B 160 kW to 315 kW regenerative power supply The regenerative power supply can supply multiple units with power using a central power supply connection. In regenerative mode, the power is fed back into the supply system. Using the MDR60A/MDR61B lets you save power and installation costs. Braking resistor type BW BW series braking resistors are available for operating MOVITRAC® B frequency inverters and MOVIDRIVE® B drive inverters as generators. Using an integrated temperature sensor, the resistor can be protected without external monitoring. Line choke type ND ND series line chokes increase inverter overvoltage protection. This is an important characteristic in rough industrial power supply systems, especially if the inverter is installed near a supply transformer. Line filter type NF NF type line filters are available for EMC-compliant installation as specified by EN 61800-3. They suppress interference emissions on the line side of inverters. These line filters ensure that limit value class C1 is maintained on the supply end. Output choke type HD HD series output chokes suppress interference emitted from unshielded motor cables. They enable the motor to meet limit value class C1 requirements in accordance with EN 61800-3 in EMC-compliant installations. Output chokes provide an alternative to shielded motor cables in EMC-compliant installations. Output filter type HF HF series output filters are sine filters that smooth out inverter output voltage. Output filters are used for group drives to suppress discharge currents in motor cables and for long motor cables to prevent voltage peaks. MOVIDRIVE® B application inverters, with their high basic functionality and wide range of options, are the cost-effective and energy-efficient option for demanding application tasks. for "safe motion/position monitoring and communication"
is our contribution to your plant and machine safety. In addition to functionally safe drive technology, we are offering various safety services. safetyDRIVE not only helps you to prevent accidents, but also reduces costs in safety zones and increases productivity. Click here for more information about safetyDRIVE and the EC Machinery Directive 2006/42/EC. Modern PT1000 temperature sensors replace the KTY sensors.